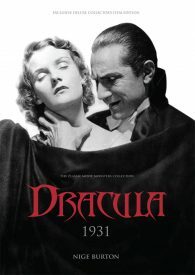 The Dracula 1931 Ultimate Guide evokes the brochure you might have bought at the cinema in 1931! Celebrate Universal’s iconic monster movie with a dedicated luxury magazine, called simply Dracula Universal 1931, and beautifully written and lavishly illustrated with many rare stills, posters and press books. Classic Monsters founder, author and horror film historian Nige Burton, has dug deep into his crypt to unearth the compelling story of the making of what, by many, is considered the first proper horror movie. If you are a fan of the Universal classic monsters, then this unique tribute to this horror great is most definitely for your collection, which will become enriched as we add future titles in the series. It’s the perfect reference guide for any fan of Bela Lugosi’s most iconic performance. Classic monsters are back. 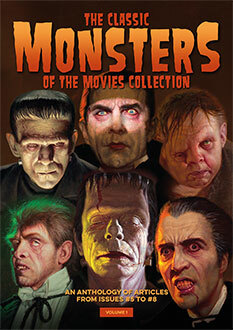 You can now look forward to a long running series of books celebrating all your favourite legendary monster movies! Frankenstein 1931 and Dracula 1931 are excellent resources on the plots, casts and the making of these two iconic film classics. Recommended for fans of these films in particular, the horror genre in general, and students of film history. Any fan of the classic Bela Lugosi Dracula will love this ebook, but you don’t have to be a horror obsessive to get a lot out of it. It’s clearly been a labour of love for the author, without being sentimental or rose-tinted about the subject matter. I was pleasantly surprised at how much information is packed in, not just about the main stars, but about crew members and the events “around” the film, like the stage adaptation which preceded the film, and of course Bram Stoker’s original novel. All in all, a very satisfying and enlightening read. This is a smashing little book and easy and enjoyable to read. It isn’t so much the Dracula movie appraisal – lots of people have done that – but loved the fascinating insights into the film crew and minor actors included in this book in the form of one-or-two page articles. A nostalgic look-back into the infancy of the horror film industry and an era long gone now – I’m beginning to get morbid! Anyway this book is a real gem – don’t miss it. This is the definitive look at the classic 1931 film. A perfect companion for those familiar with the movie and also those who are discovering it for the first time. The author’s passion for Dracula is palpable. It’s written in a delightfully accessible, quirky way and is also beautifully illustrated. A superb exploration of a great film. Very informative book. It provides insight and details of the movie and the background of the actors. A great and informative read about a movie I love. I Bought the Dracula 1931 Ultimate Movie Guide, from you guys at MAGNA Horror-Con, Sunday 12th July 2015… BEYOND AWESOME! Congratulations! Your efforts have surpassed EVERY-SINGLE fan publication since the Movie was originally released in 1931!!! I picked up a few copies of these myself while at Horror Con UK to enlighten my friends back in the US. The Dracula Guide is full of wonderful tidbits of lore and facts, the photos are awesome, a must have for Classic Dracula fans!! Thanks for the great customer service and finding a more affordable US shipping option. I ordered a subscription and physical copies of the books, but I couldn’t wait and downloaded the pdf’s. Thumbs up and highly recommended – as a graphic designer, I really appreciate the nice, clean design. Can’t wait for the magazine! Lovely, lovely tribute to the classic 1931 Bela Lugosi Dracula. Well written, informative text and amazing visuals. Thanks so much for the Dreaming of Nightmares Guide, I also received the Ultimate Guide to Dracula last week, I really look forward to the superb writing, and beautiful presentations of these magazines and Ultimate Guides. well done to Nige Burton, and Jamie Jones, and all the other people involved in this amazing publication of Classic Monsters of the Movies. I look forward to receiving Dracula Prince of Darkness, and Classic Monsters, issue number 5. I ordered The Mummy last week, I am really looking forward to that as well. Thanks once again, for producing a magazine, that is of very high quality, and presented to such a high standard that the fans enjoy. I mention this magazine to lots of people, and I get overwhelmed by the quality, and enthusiasm involved by the authors. I can’t wait for more Classic Monsters of the Movies. This is a FANTASTIC anthology of one of the truly great horror movies. Very informative, with great behind-the-scene insights and wonderful photos! Both sharply written and illustrated. Once again, the photos are so crisp the almost appear to leap off the pages.